Sankri is the last village connected by bus and has no telephone connection as of yet (the village was electrified only during 2007). 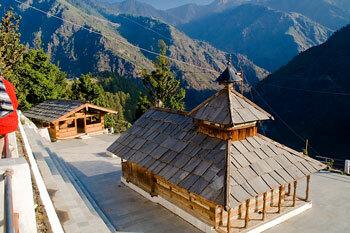 The village is about 13 Kms inside the Govind Wild Life Sanctuary (Netwair is the place where the check post is located). Sankri is the roadhead to the almost untouched Har-ki-dun (3566m) with the Swargarohini Peak(6096m) towering above it in the backdrop. 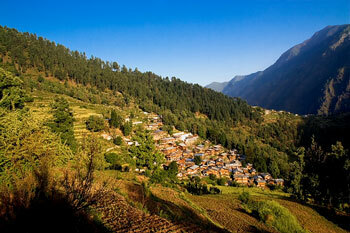 The base camp for Kedarkantha trek is located just a few hundred meters away from Sankri in Sond village. To reach the base camp YHAI arranges a bus from Mussoorie Youth Hostel. The bus starts at 7:30 AM and the most tedious part of the whole programme starts with this 8-10 hours of tiring journey of 180 odd Kms on the day after our reporting at Mussoorie. This is the place where we would spend next day and a half to acclimatize ourselves with the challenges of higher altitudes. In fact, ever since reporting at Mussoorie youth hostel, Mussoorie jheel (reporting camp, six km before Mussoorie as you go from Dehradun), you are on acclimatization programme. Acclimatization and insulation are key to preventing altitude sickness. Acclimitization in the form of spending sufficient time at gradually higher altitudes is absolutely necessary for the body to adapt to cold and lower atmospheric pressures above 6000 ft. In true sense, we realized that we got acclimatized to the climatic conditions only 2-3 days into the real trek when we were at around 10000ft height. As the bus passes through the Himalayan ghats, picturesque views of hills, valleys, gorges, and forests is a common place � A God sent opportunity for photography enthusiasts. Till Naugaon the bus travels along the Yamuna river (in opposite direction to the flow of the river), from where the bus deviates from the route to Yamunotri. Purola and Mori are other two �towns� that one comes across on the way to Sankri. Mori is the last place where you get mobile network � BSNL and Netwair is the last village till where BSNL landline network extends. At Mori you can see an impressive site of a school building situated on a river bank and some tents mounted on the accompanying grounds � possibly for some trekking team. Sankri camp site is a lovely location where tents are put up on three tiers along the slope of the hills. Base camp was in fact situated by the side of the hamlet called 'Sond'. Thanks to Mr PS Chauhan, the YHAI volunteer and Field Director, we got a taste of discipline that was expected of us throughout the trek. The evening was cold and our monkey caps, gloves and jerkins were in position. Campfire was organized by Prvious day group. Realization: It is better that you go with preparation for campfire, as I had noticed that your participation will not only make yourself known to others but also gives you some energy in that chilling weather. Facilities like electricity and toilets were available here, which you will never see again through out the trek. Next day starts with light exercise and jogging and after seeing off the KK-7 group, we were to go through one of the best experiences of the trek � rappling. 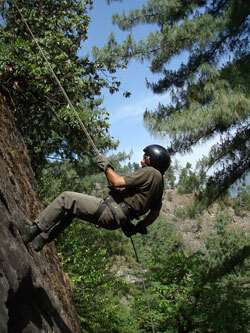 You are introduced to equipment used for rappeling, demonstration given and participants are made to do the same. Observation was that for most of the people who were over thirty, their stance was not what was desired or demanded by the instructor. It is a clear sign of dwindling suppleness in the body. Realization: If you are going to make trekking your hobby, you must work on your physical fitness in a much more methodical way. I had realized that trekking can open your eyes to the harsh reality that you are not as young or as capable as you had thought of yourself in your day-to-day life. After a bit of climbing we were on our way back to our base camp, when the instructor took us through an ancient temple of Sond � Siva-Someswar temple � the main diety was taken to surrounding hamlet � in turns five of the hamlets receive the deity. It was also told that locals believe that it is the temple where Dhuryodhana used to pray. There was an intresting spectacle � Golden eagles of Himalayas flying below your line of sight in the valleys adjacent to the slopes where we were practicing rappling. At least once we saw a golden eagle passing yards away from us �photography hobbyists had a great opportunity.